Support for Office for Mac 2011 ended on October 10, 2017 . All of your Office for Mac 2011 apps will continue to function. However, you could expose yourself to serious and potentially harmful security risks. Upgrade to a newer version of Office so you can stay up to date with all the latest features, patches, and security updates. If you have an Office 365 subscription, you won’t need a product key to activate. Instead you’ll sign in with the email address that’s associated with Office. In the Get Started wizard, click Sign in to an existing Office 365 subscription. Tip: If the wizard isn’t open, start an Office application and click Activate Now. Sign in with the email address that’s associated with Office, and select Next. Tip: If nothing happens when you select Next, use the Enter key on your keyboard. 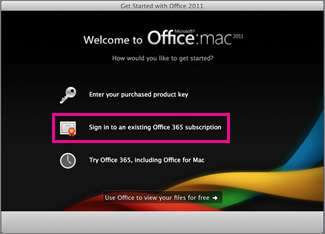 If you have a one-time purchase of Office for Mac 2011, you’ll need a product key to activate. Find your product key for Office for Mac 2011. In the Get Started wizard, click Enter your purchased product key. 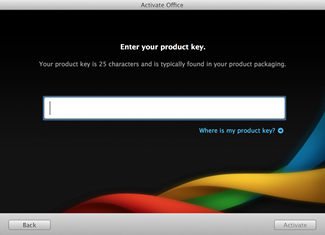 In the Activate Office wizard, enter your product key and click Activate. Important: If your copy of Office came with a PIN instead of a product key, go to https://www.microsoft.com/mac/getkey and enter your PIN to get your product key. Still having issues? Contact Microsoft Support.